I've had this pattern in my head for a few days now on taking a simple patchwork and making a design with the fabric to create a baby quilt. It worked up really fast and it was fun to play with color and pattern as well as light and dark. I like the idea of it looking like interlocked Ts or Xs. It is just a simple idea but I think often for baby quilts especially simple is best. Mr. Hive doesn't really pay much attention to quilts here, it is just part of life. Last night as I was binding the quilt he came up and gave it a closer look and asked me "who quilted that one?". I told him I did. And he payed me a nice compliment. He said "Wow, your quilting is getting better." Who'd have thought he would notice that? It made me happy to hear. I'm taking pictures of the quilt pre-wash to see if which look I like best. So tonight I'll wash and dry it and then take a few more shots. Melissa's party yesterday was a huge success. Congrats Melissa! And congrats to Dawn, that won the charm pack for All Dressed UP. I'll be sending that out to you this week! There are some other winners out there - go check Melissa's blog. Nanette, I love that baby quilt. I agree, I think for babies, simple is best. Nice compliment from Mr. Hive :). The quilt is more than precious. I love it when my husband pays attention to the quilting. Sometimes he tries to use "fat quarter" in a sentence for no particular reason. Always cracks me up. 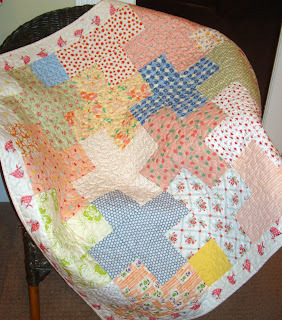 The baby quilt is wonderful -- I particularly like the border fabric you used in it! I got a good chuckle out of your post about "Mr. Hive". I picture a big bee wearing his hat and tie with briefcase in hand, telling Mrs. Hive "very nice my dear, you're quilting is getting so much better". Tee hee! Nanette~! Your quilting IS getting a lot better! :) Mr. Hive that cracked me up, it's better than Mr. Unknown, which is what my guy wants to remain... I'm really likin' that baby quilt! That quilt is perfection. Love the fabric and the pattern. The border material is precious. Glad Mr. Hive is paying attention. LOL! That's a cute story. I just about drop my dentures ( if I had any) when my husband notices my quilting. Nice when they do, though. I have to admit that when we built this house he made my sewing room larger than our master bedroom. Maybe they notice more than we think. Sweet and simple. I love it! Your hubby gets a big hug. What a sweet baby quilt! I love that bandanna girl border! As always, Nanette-delightful!! You are so creative AND industrious!! 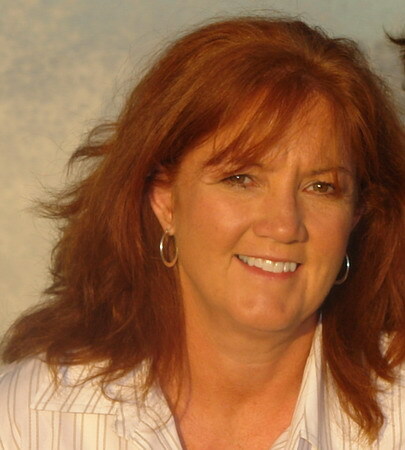 Thanks for the pleasure your blog brings not only to me but so many others!!! That is so cute! I love it! Good job Nanette! The baby quilt is darling. Everything that goes on in my sewing room is a complete mystery to my husband. When I start talking about it, his eyes glaze over!! I love that quilt. Very cute. I am getting to where I really love a well made, simple quilt, and this fits the bill! You are one busy girl!!! Nanette, the border print on the baby quilt is so cute! Oh, and our "Mr's" must be cousins - hah! Cheers! What a good hubby you have for noticing!! What a cute baby quilt!! I love that border. You are so funny! My Mr. doesn't pay much attention either, so when a passing compliment is made, it certainly does not go unnoticed. I love the quilt, very sweet and great design! Nanette - I believe those kinds of quilts are called tessellations. I made one years ago that looked like an interlocking letter "H" for a friend who's name started with H. Yours turned out really cute! Boy! you just never know what husbands are really paying attention to. I think most times they really notice things, they just don't voice it. I love the soft pastels in that baby quilt. who is it for? Love the border fabric! If only we had a baby on the way. This is a great quilt. I will have to keep it in mind for the next new baby at husband's office. 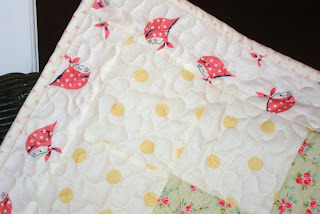 What a fun baby quilt...and I guess "your quilting is getting better" is a great compliment! Dawn who won the pattern and fabrics is my good friend...yay for her! aww... so cute! The border fabric is very charming. Love the baby quilt. It is adorable. Your hubby's comment made me laugh. Living with a house full of men it rang true. 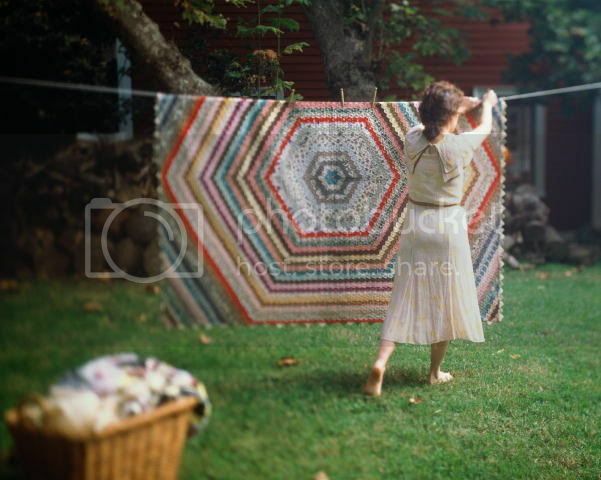 Nanette, I love how simple that quilt is! It is so cute! I love the pastels you used in this baby blanket Nanette! The little cross design is very sweet as well! Mr. Hive?? You kill me. BTW...I hope you realize what you've created with your cottages...hehehe...I think it's great! Hey I love that pattern! Very clever. And the border with the little girls in their scarves is so perfect. Your quilting does look VERY nice. Beautiful quilt! Love that cute border. And what a nice compliment from your hubby. The quilting is gorgeous. darling quilt...i agree..simple can be so nice. what a nice thing for you hubby to notice your quilting...and improvement at that! he's a keeper! What a man! and the quilt is beautiful - I especially love the little red kerchiefed girl in the border fabric. You must have the BESt stash! I love that you call hubby "Mr. Hive" - too cute! I'm glad he finally gave you a compliment! The baby quilt is absolutely the cutest! 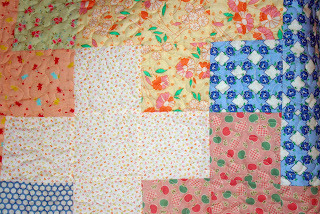 Simple is best for baby quilts, isn't it? Love the border fabric, too! You are such a talented girl, and you're quilting is good, too! Sorry - couldn't resist! !